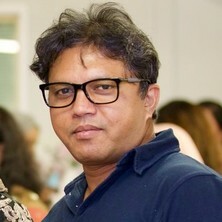 Dr Mobashwer Alam is a Plant Geneticist and Breeder with eighteen years' research and teaching experience in public and private industries, and in the universities in Australia and Bangladesh. He has been working at the Centre for Horticultural Science, QAAFI, UQ and is based at Maroochy Research Station, Nambour, QLD 4560. Over the last eighteen years, Dr Alam received experiences in multi-disciplinary research, including Plant Breeding, Quantitative Genetics, Genomics, Plant physiology, and Crop modelling. Before joining at QAAFI, UQ, Dr Alam had been working as a Senior Plant Breeder (Grain SOrghum) at Nuseed Pty Ltd. He achieved his PhD in Plant Molecular Genetics in 2013 through the School of Agriculture and Food Sciences of the University of Queensland. During his study at UQ, he worked with Crop Physiology and Modelling group at St. Lucia, and Sorghum Breeding group of Hermitage Research station, Warwick. Before coming in Australia as a PhD student, Dr Alam had been working as a Lecturer and Assistant Professor of the Department of Genetics and Plant Breeding at Patuakhali Science and Technology University in Bangladesh. Throughout his academic and research career, he worked on multiple crops including Macadamia, Stone Fruits, Sorghum, Sugarcane, Lablab bean, Tomato, Okra, and Ashgourd. He is interested in developing rapid breeding tools and utilizing plant Genomics in tree crops improvement. Alam, Mohammad Mobashwer (2013). Genetic mapping and modelling of tillering in sorghum PhD Thesis, School of Agriculture and Food Sciences, The University of Queensland. O'Connor, Katie , Hayes, Ben , Alam, Mobashwer and Topp, Bruce (2017). Identifying markers associated with disease-harbouring stick-tights in macadamia. In: TropAg2017: Book of Poster Abstracts. International Tropical Agriculture Conference TropAg 2017, Brisbane, Australia, (). 19-20 November 2017. Alam, Mobashwer, Neal, Jodi, O'Connor, Katie, Nock, Catherine, Langdon, Kirsty and Topp, Bruce (2017). Morphological and molecular characterization of self-pollinated vs naturally out-crossed progeny of macadamia: a case study of 'HAES741'. In: TropAg2017: Book of Poster Abstracts. International Tropical Agriculture Conference TropAg 2017, Brisbane, Australia, (61-61). 19-20 November 2017. Toft, B., Topp, B. and Alam, M. (2017). Trait mining for high-density macadamia planting systems: how important are more detailed architectural characteristics. In: International Macadamia Research Symposium, Hawaii, United States, (). 13-14 September 2017.